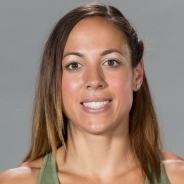 A former Division I rower and Ontario native, Alessandra Pichelli is a six-time CrossFit Games veteran (five individual, one team). She started CrossFit in 2010 and competed in her first regional just one year later. After joining team CrossFit Diablo in 2012 and helping the team to a third-place finish at the Games that year, she transitioned to the individual competition and has competed in every CrossFit Games since, missing the podium by just one spot in 2013. In 2016, Pichelli won the CrossFit Liftoff weightlifting and has placed 9th and 11th at the 2016 and 2017 CrossFit Games respectively.